Spring – beautiful and bountiful and much appreciated by the members of the Herricks Leisure Club after we endured “The Winter of our Discontent.” As the landscape blooms and entrances so do our seniors grow and learn from our encounters and activities at our club. Our meetings of March 29 and April 5 were precluded by the school recess which commemorated Passover and Easter, but we returned on April 12 to a fully-scheduled assembly. Corresponding Secretary Terry Lanese reported on several illnesses and Legislative Chairlady Tess Fiorentino notified us that new Medicare cards are being implemented. Treasurer Jim Kovalsky informed us of March income and expenses while Membership Chairlady Jeanette Kovalsky told us of the substantial return on the “Trash and Treasure” fundraiser. Director Hilda Escobar announced that Jeanette will be our honoree for Senior Recognition Day this year. Our guest singer Carl Klippel serenaded us with his guitar and voice. We were then visited by Superintendent Fino Celano and Assistant Superintendent for Business Lisa Rutkoske who spoke of the notable accomplishments of the Herricks students. President Lillian Ciesluk conducted a remembrance of 6 birthdays which was followed by a tasty pizza party. 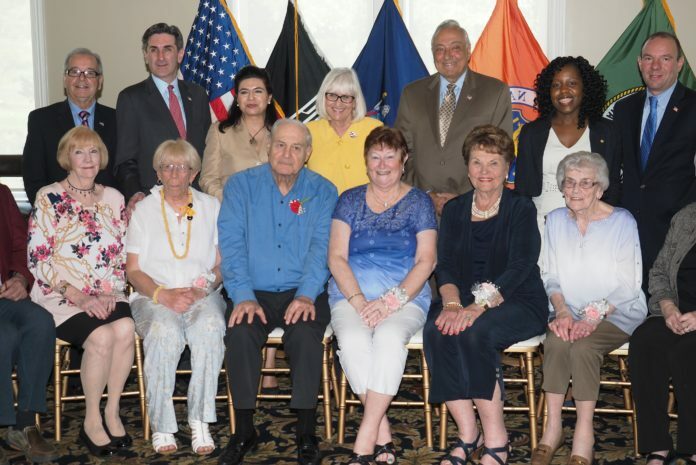 When we convened on April 19, we learned that our traveling Vice President Frank Vendinello and his wife Ann were vacationing in New Orleans and that the Schrecks are back from their Florida sojourn. We were alerted to a vehicle scam and the STOP program. On April 26, Frank recommended New Orleans to the “Young at Heart” and we were advised that 97 year old Stella Siegel had passed away. A most entertaining show ensued when our guests Lynn Gamboni and her partner Lou danced into our hearts with an engaging performance of ballroom dance numbers. A delightful trip occurred on April 30 when we ventured to the Westbury Manor to partake of a succulent lunch and the effervescent show “Funny Girl” arranged by Marie Cristello. We gathered together on May 3 for a celebration of 4 birthdays rendered by Frank Vendinello in the absence of our vacationing President. Jim Kovalsky submitted a succinct financial report. Our convergence of May 10 was an exceptional one. After a brief meeting, we honored our 96 year old Legislative Chairlady Tess Fiorentini who after countless years of service to our club and the community is moving to Arizona to be with her son. Director Escobar offered a presentation and a collage from our group. Fiorentini’s niece Kathleen spoke admiringly of her aunt’s long-time civic-mindedness and Fiorentini’s brother-in-law Mario concurred. A fitting tribute ensued from school officials and politicians. Superintendents Celano and Rutkoske praised her for her passion for community. Town Clerk Wayne Wink and Councilman Peter Zuckerman relayed that they were sad to lose Fiorentini but wished her well. Town Supervisor Judi Bosworth presented a proclamation declaring May 10 a Day of Recognition for Fiorentini. Fiorentini thanked our members and all the dignitaries who attended this special event. To top off this iconic afternoon, we savored a catered chicken luncheon in honor of Mother’s Day.